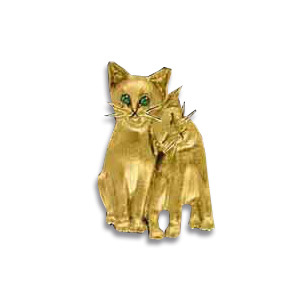 14kt yellow gold pendant in the shape of two cat pals. Features emerald stone eyes. Item height: 1in. These pieces are not flat. They are dimensionally sculptural. Designed by animal sculptor Jack Slack. Made in the USA. My daughter loved the pendant.